← Your Information Sources: Are they Left or Are they Right, or has the Ministry of Truth Been Established? Last December I wrote this post at another site. Thought it was worth sharing again! I hope your holidays are filled with joy! The Whos down in Whoville celebrated the spirit of Christmas without all the material stuff. That’s what I would like to believe would happen even if someone ” packs up the presents! The ribbons! The wrappings! The tags! And the tinsel! The trimmings! The trappings!…all that material “stuff” we’ve come to cherish. Our true treasure is not something that anyone can take away from us. Terrorists of all kinds try to “take away” things we treasure. This includes not only material possessions but also includes economic and physical safety, peace of mind and even the freedom and liberties we have been blessed with to enjoy in this country. I believe that’s is where the 12 values of the 9-12 Projects become very, very important. That is why I believe it is more important than ever to be certain of what you believe. I believe that if we hang on to these core values and principles, which serve as both anchor and compass, we will come through anything. Did you ever hear the great advice, “Honesty is the best policy” as a child? You have probably heard the story of George Washington chopping down an cherry tree and then stating to his father, “I cannot tell a lie.” It is probably fiction, but it is meant show that one of the Founders and our first President was an honorable man and that this sense of honor was instilled in him at a young age. One of the nine principles: “I must always try to be a more honest person than I was yesterday” embodies this value. What if we each become more honest with each passing day? Removing all lies from your life might be hard work, but I believe that the end result is worth it. Knowing that you value honesty and striving to be an honest person is something no one can take from you. Reverence can be defined as “honor or respect felt or shown” (as a noun) or as “to regard or treat with reverence” (as a verb.) What do you revere? If you revere material possessions they can go away in the blink of an eye. If you revere something that is more lasting, it cannot be taken away. Our country’s Declaration of Independence ended with: “With a firm reliance on the protection of Divine Providence…..” In other words, the belief in something bigger than yourself which demands reverence and respect is where your treasure lies. That belief, if planted in a firm foundation, can never be taken. There is a line in a song that I love (When You Believe) that says: Though hope is frail, it’s hard to kill. A hope based on a transcendent source of truth is not only hard to kill, it cannot be killed. Thrift is defined in one sense as: the wise economy in the management of money and other resources; frugality. Living your life as a good steward of everything you have been given is not something that can be taken away if you are clear on what it is you believe. Humility is the quality of being modest, reverential….never being arrogant, contemptuous or rude. If this is one of the values that you hold dear, it cannot be taken away. You may not be able to display humility at all times, but if it is something you find valuable and part of your belief system no one can take it from you. Charity is usually thought of as something given to help the needy. Even if all of your material possessions are taken away you can still perform acts of charity. Another definition of charity is generosity toward others or toward humanity. If this value is a part of your core set of beliefs, it is not something that can be taken from you. It may become challenging to be charitable, but if your belief system incorporates this value it will remain with you. This is the quality or condition of being sincere; genuineness, honesty and freedom from duplicity; closely tied to the first value listed which is honesty. If this is part of “who you are” who could take it? Moderation means being within reasonable limits; not excessive or extreme, but also can mean not violent or subject to extremes. If this is part of your core value system it will not disappear, even if you are placed in a position meant to push you into behaviors and actions that go against this belief. I am not sure I need to define this because we all know what hard work is like. In addition, the sense of accomplishment when you see the results of your hard work is priceless. If you believe that this is one of your core values, nothing can make that belief go away. Courage is defined as the quality of mind or spirit that enables a person to face difficulty, danger, pain, etc., without fear; bravery. I am not so sure about the “without fear” part, but the rest of the definition outlines something no one can take from you. “Courage of your convictions” comes to mind. If you believe in something and it is part of who you are people might make it difficult for you to express these openly, but it does not change the fact that it is part of what you believe. This is something I am afraid we have lost sight of in this country and, for that matter, in the world. Suffering the consequences for bad decisions is something that has become politically incorrect. We make “explanations” into “excuses” and no one learns anything and we ALL suffer. However, if you believe that taking personal responsibility for your actions and decisions is a value that you hold, nothing can change that. Gratitude can simply be defined as thankfulness. The expression of gratitude is healthy and can generate optimism in the most trying of times. Being grateful for the blessings in your life cannot be eliminated in rough times unless you willingly give this up. Which leads to the conclusion on all of these values: if you know what you believe and you choose to live life according to these values the only way they can be taken from you is if you give them up willingly. I am not saying this is always easy as it is not. And all of this reminds me of my favorite movie of all time: It’s a Wonderful Life. Mr. Potter is a man whose value system is completely based on material possessions. He watches throughout the movie as George Bailey struggles through life without many material possessions. What he does have, though, is a solid core set of values. He makes a difference in peoples lives because he lives by those principles and values. He is rewarded in many ways and most of them are not “material” rewards. His brother, Harry, refers to him at the end of the movie as “the richest man in town.” The reason Mr. Potter hated him so much was because he could not “get his hands” on these riches. He tries to take everything away from George but never succeeds because George’s values and principles could not be stolen. 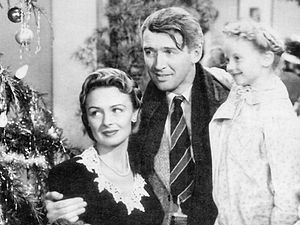 Yes, I believe George was the richest man in town and that’s because he knew what is truly valuable in this life….and it IS a wonderful life! Even if the Grinch takes all you have! This entry was posted in History of US, Restoration of our Constitutional Republic, Terrorism, World View and tagged 9-12 project, Founding values, Grinch, It's a Wonderful LIfe, Mr. Potter. Bookmark the permalink.